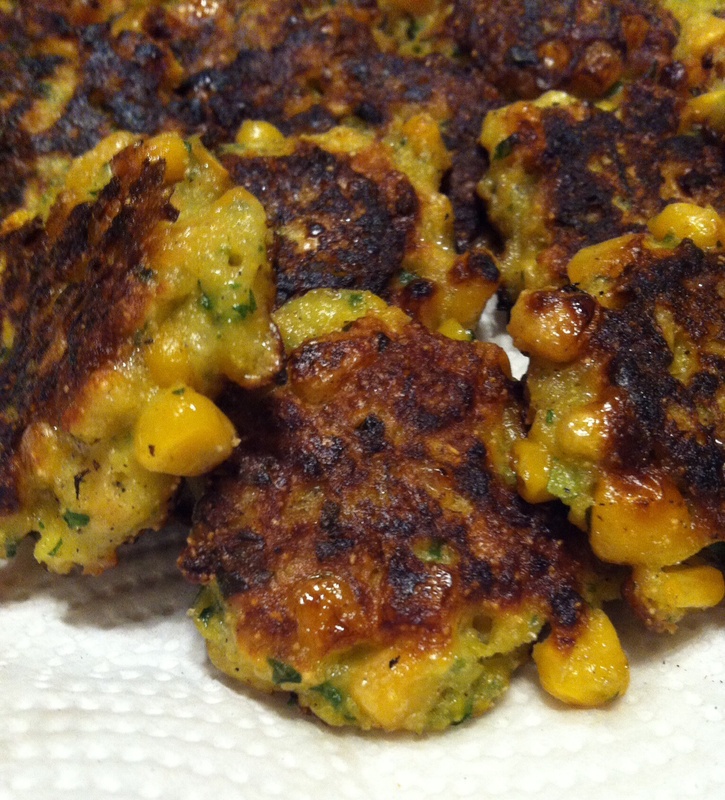 These corn fritters are so good!! I made them as appetizers served with sweet chili dipping sauce. (See tip below) You can also make them for brunch, just drizzle wiith maple syrup and serve alongside bacon and eggs. I took this recipe from the Best of Bridge Cookbook “Bravo”. 1. In a food processor, combine 1/2 cup (125 ml) of the corn, green onions, egg, flour, cornmeal, cilantro, sugar, hot pepper sauce, salt and pepper; pulse a few times to blend. Transfer to a large bowl and stir in the remaining corn. Cover and refrigerate for 20 minutes to allow batter to thicken slightly. MAKE AHEAD: Let fritters cool, cover and refrigerate for up to 1 day or layer between waxed paper in an airtight container and freeze for up to 2 weeks. Reheat on baking sheets in a 375F oven for 15 minutes. 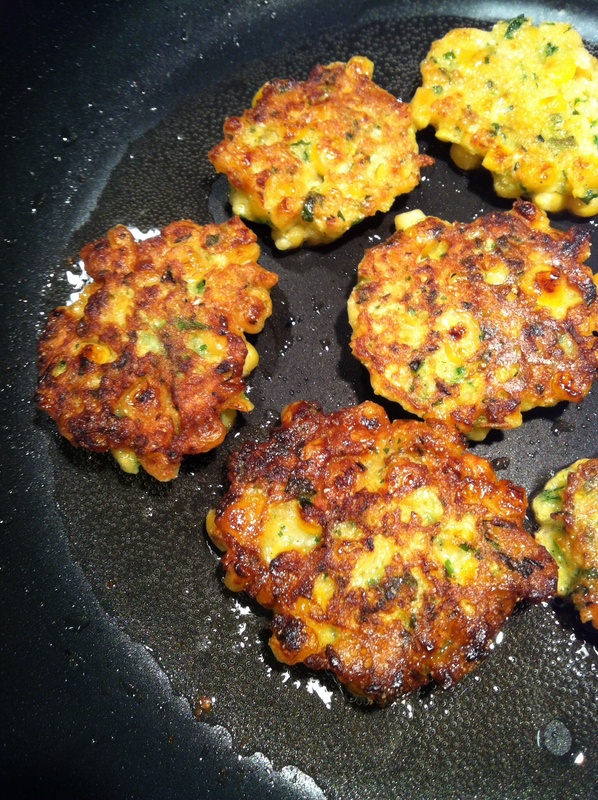 TIP: For appetizer-size fritters, drop tablespoonfuls (15 ml) of batter into pan. They will only need about 2 minutes per side to brown. My mother made these cookies all the time when I was a kid, and quite honestly, this is the first time I’ve ever made them for myself. I love trying new recipes all the time, so I often fail at posting and making those most loved recipes from the past. This recipe is taken from Better Homes and Gardens New Cookbook. I omitted the cinnamon and the cloves from the oatmeal cookie recipe to make the oatmeal chocolate chip. I also omitted the nut option from the oatmeal-chip recipe. 1. In a large mixing bowl beat butter with an electric mixer on medium to high speed for 30 seconds. Add brown sugar, granulated sugar, baking powder, baking soda, and if desired, cinnamon and cloves. Beat until combined, scraping sides of bowl occasionally. Beat in eggs and vanilla until combined. Beat in as much of the flour as you can with the mixer. Stir in any remaining flour. Stir in rolled oats. 2. Drop dough by rounded teaspoons 2 inches apart onto an ungreased cookie sheet. Bake in a 375F oven for 8 to 10 minutes or until edges are golden. Cool on cookie sheet for 1 minute. Transfer to a wire rack and let cool. Oatmeal-Raisin Cookies: Prepare as above, except after stirring in oats, stir in 1 cup raisins or snipped dried tart cherries. Makes about 54 cookies. 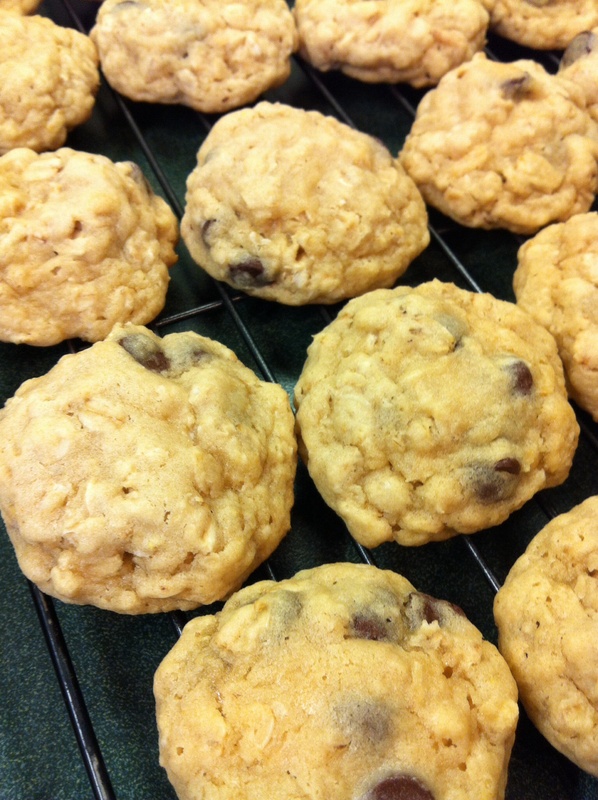 Oatmeal-Chip Cookies: Prepare as above, except after stirring in oats, stir in 1 cup semisweet chocolate, butterscotch-flavoured, or peanut butter-flavoured pieces and 1/2 cup chopped walnuts or pecans. Makes about 54 cookies.